"We have brought the sights and sounds of Pennhurst into your homes with their most brutal and constructive forms." The Pennhurst Asylum or Pennhurst State School and Hospital is considered to be the most haunted mental hospital in Pennsylvania. However, the structure was not originally opened as a mental hospital. It was originally intended to be both a school and a hospital. When it opened its doors it was originally called “Eastern Pennsylvania State Institution for the Feeble-Minded and Epileptic”. 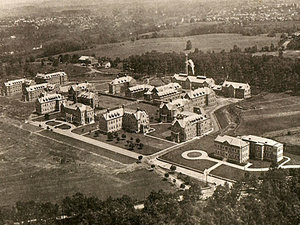 The purpose and intent of the hospital and school was to provide a place that offered rehabilitative services and programs to individuals that were considered to be mentally challenged or disabled in a physical manner in the Southeastern region of Pennsylvania. Despite the good intentions of those that established the institution, the services offered were far from productive. Little did all involved realize that Pennhurst Asylum would eventually be known as one of the most haunted places in Pennsylvania. Today, what was once known as the “Eastern Pennsylvania State Institution for the Feeble-Minded and Epileptic” is known by many different names. 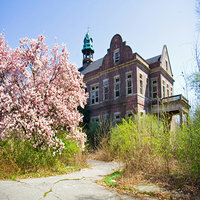 Many refer to it as “Pennhurst State School and Hospital” while others refer to it as “Pennhurst Asylum”. For the purpose and intent of this coverage, we will refer to it as “Pennhurst Asylum” or “Pennhurst State School” as those names are the most common names associated with the structure and the services that it once offered to those that faced physical and mental challenges. In the year of 1903, the State of Pennsylvania recognized the need to create a structure that would offer a placement for individuals suffering from mental and physical complications. A special team discovered these individuals spread out in mental hospitals, almshouses, prisons, hospitals, and even reformatories scattered across the state. 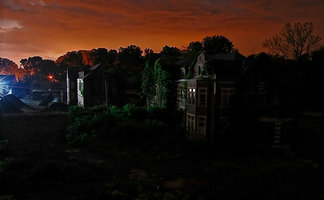 While the purpose of the structure and its services were admirable, it was the structure and services that eventually led to the demise of Pennhurst Asylum. While there are many haunted places in Pennsylvania, this haunted mental hospital or haunted school – depending on how you look at it – is considered to be one of the most distinctive. The structure was designed by a man by the name of Phillip H. Johnson. The original buildings were two stories in height and constructed of beautifully designed bricks that were red in color. These were enhanced by trimmings composed of both granite as well as terra cotta. There were tunnels connecting the buildings that were designed to not be affected by fires that could develop. Several different cottages surrounded the main buildings. In addition to this, there were a few dormitories that were relatively small in nature and a day room where residents could exercise and enjoy each other’s company. Despite the exquisite design of the outside of the Pennhurst Asylum, the inside showed no signs of appeal. On the 23rd day of November in the year of 1908, Pennhurst accepted its very first resident who was often referred to throughout the history of the haunted mental hospital as “Patient Number One”. While the building was advertised as providing school services, the actual number of residents that got to enjoy these services was extremely limited. However, there were educational courses that many got the opportunity to experience. These services focused on teaching the residents basic care skills that would allow them to become self-sufficient and productive adults. While many did benefit from these school services, many of the residents experienced a great deal of abuse because they simply could not handle the lessons or control themselves during instruction because of their condition. Rumor has it that these individuals were intentionally degraded for the purpose of embarrassment, drugged through the means of IV solutions in the veins, and even chained to their beds. Because of this abuse, it is believed that the haunted school and mental hospital has a large number of school spirits that are young and confused wandering throughout the structure commonly identified as Pennhurst Asylum. When this haunted school and hospital was in full operation, they faced issues of overcrowding as far as the residents were considered. There was a lack of funding from the State for their day to day operations, a lack of appropriately healthy facilities for the residents of the institution, and a serious shortage as far as staff was concerned. As a result, it was not at all uncommon to walk through the building and smell terrible odors such as dirty diapers, urine, sweat, mold, and other offending smells. It was also common to find that the residents were not clean and appeared to be extremely unhappy. Despite the fact that many residents were locked behind the grips of their mental illnesses and could not speak to express their level of dissatisfaction, just one look around indicated that the individuals were experiencing terrible situations and issues at their stay at Pennhurst Asylum. Today, it appears that the residents still linger here – even after death. Forever bound by their physical and mental disabilities as school spirits in one of the most haunted places in Pennsylvania – struggling to escape. In life, it was not at all unusual for patients to be exposed to harsh and often deplorable conditions. Despite the fact that it was not the purpose and intent of the state to subject the residents to such treatments, the lack of funding and accommodations coupled with a serious issue of overcrowding led to many different types of abuse. It is believed that these conditions and the abuse suffered there led to the fact that the building is now considered to be the most haunted mental hospital in the entire nation. Many were confined to cribs that were composed of cold metal, while others were simply allowed to wander with little to no clothing. It was not at all uncommon for human waste such as feces and vomit to line the floors of the asylum and for patients to wander around in it with no shoes on. Many were exposed to both physically aggressive abuses while others were sexually abused. In the year of 1977, there was a lawsuit against the Pennhurst Asylum. It was found that the school and mental hospital violated the rights granted by the Constitution of the patients that resided there. By the time that the year of 1987 rolled around, it was forced to close down. While this process took some time, the patients that remained at the school were either transferred to other locations or they were completely discharged. Despite the fact that the building stands abandoned today, there are many that state that there are many types of paranormal activity that take place within the structure. Pennhurst Asylum is considered to be both a haunted mental hospital and a haunted school with numerous ghosts, apparitions, and school spirits lingering there. This fact has led to the structure gaining the reputation of being one of the most haunted places in Pennsylvania. Many reports of paranormal activity have been documented within this structure. There have been many that have visited the school regions of the building and have observed full body apparitions that they believe to be the school spirits of past residents. Many have simply felt a cold breeze brush by them quickly while others have observed spirits actually moving objects or engaging in other physical activities. In the haunted mental hospital section of the asylum, many have heard the sounds of children and adults screaming and crying as if they are suffering from tremendous amounts of pain and agony. Doors can be heard slamming throughout Pennhurst State School and whispers can be heard echoing off the walls. If you have an interest in a haunted mental hospital, a haunted school, or simply desire to learn about the most haunted places in Pennsylvania, you will find the Pennhurst Asylum to be highly mystifying and intriguing. Even today, the stories and events of the physical and spiritual residents remain to be some of the greatest unsolved mysteries. Is the Pennhurst State School haunted? We will let you decide.